Audiences dread a performance that begins with an “important announcement” over the speaker system. Usually it means that a singer is unwell but, praying our indulgence, will sing anyway, or, worse, that a singer is unwell and has been replaced. The second was the case for the opening night of COC’s new production of Peter Grimes. American tenor Anthony Dean Griffey would replace an ailing Ben Heppner in the title role. In the event, Griffey’s performance was so magnificent that it was difficult to believe even Heppner could do better. The new production – a co-production with Opera Australia, Houston Grand Opera and west Australian Opera – is very close to ideal. Director Neil Armfield, set designer Ralph Myers and costume designer Tess Schofield have kept the action in a small fishing village very like the Aldeburgh of George Crabbe’s source poem The Borough (1810), but they have moved the time period to 1945, when Britten’s opera first premiered. The entire action takes place inside the community hall, a large auditorium with a small curtained stage at the back. Besides obviating the need for complicated changes from one location to another during the opera, the community hall reinforces the principal theme of the opera – the power of the community over the individual. By placing all the action in a single room, Armfield and his designer focus our attention on the utter lack of privacy in a small village, on the pressure to conform and on the gossip that maliciously arises regarding anyone, like Peter Grimes, who does not conform. The community hall is a place for trying legal cases, for the community work of the men and women, for drinking, for celebrations, for refuge from storms. Lighting designer Damien Cooper is a master at creating storms with banks of lamps moving up and down outside the hall’s windows that make the room seems very like a ship in rough seas. The one aspect of Armfield’s concept that does not work is in making the non-singing author, referred to in the opera as Dr. Crabbe, into a major character. Armfield gives Dr. Crabbe (Thomas Hauff) a lighted desk stage left of the proscenium where he mostly sits and observes the action. He also helps move chairs and tables to change scenes and gives a signal to the chorus when to begin. His presence is confusing and distracting. The community hall setting with a stage upon the stage is indication enough of metatheacricality without having a mute character onstage whose function is unclear. Unless you read the programme you might think he was a stage manager or director, not merely the author. The fact that he looks rather like Sigmund Freud, doesn’t help matters either. At the start of Act 3, I would much rather look at the Turneresque act drop of a cloudy seascape during Britten’s beautiful sea interlude and watch “Dr. Crabbe” sitting on stage drinking a beer. If only this unnecessary figure were removed, the production would receive full marks because Armfield’s direction, recreated by Denni Sayers, is otherwise so insightful. He gives detailed individualized actions to the entire chorus throughout the action that highlights the central irony of the opera that a community is composed of individuals even if it espouses communal rules for behaviour. Indeed, Britten and his librettist Montagu Slater, are keen to show how the most prominent members of the community also have their private vices. The holier-than-thou Mrs. Sedley is addicted to laudanum. The Methodist Bole Boles chases drinks and chases skirts. Swallow the lawyer also has a weakness of the innkeeper’s “nieces”. Griffey’s Grimes stands out from the community physically and mentally. He is a mountain of a man, taller and heavier than anyone in the cast. Like Lennie in Steinbeck’s Of Mice and Men, he is a slightly dim giant who doesn’t know his own strength. He is rough with his new apprentice as a grown dog would be with a kitten. When he hugs the boy to show he’s not angry, we worried he may accidentally crush the boy. Only the teacher Ellen Orford and Captain Balstrode realize that Grimes needs understanding and help because the community’s animosity only drives him into isolation where he is prey to visions of freedom and fantasies of persecution. Griffey has the ideal pure voice of a Britten tenor and sounds very like Peter Pears, for whom the role was written. He has a beautiful soft-grained tone, immaculate diction and ethereal pianissimi. He goes so deeply into character his acting, too, is flawless. When, at the end, Balstrode tells Grimes to row out and sink his boat, Griffey chillingly shows that Grimes only half comprehends what Balstrode means. This stupendous central performances is surrounded by excellence performances from all the singers in secondary roles. Alan Held is a commanding Captain Balstrode, able to shade his powerful bass-baritone with rage or compassion. The sweetness of Ileana Montalbetti’s soprano overrides its tendency towards a squally vibrato under pressure and makes Ellen Orford’s love for Grimes, even if it is a love out of pity, completely believable. Roger Honeywell makes a vivid impression as the rabidly religious Bob Boles, drunken as much on his narrow view of the Gospels as he is on beer. Jill Grove is the tough-as-nails innkeeper called “Auntie” and has an unwavering strong mezzo voice to match. Baritone Peter Barrett is solid vocally and dramatically as the apothecary and quack Ned Keene. And ghostly-voiced contralto Judith Christin is suitably comic as the proudly moral would-be Miss Marple of the community. Peter Grimes, however, is primarily a choral opera and anyone who loves choral music will be in heaven with the precision, colour, power and beauty of tone the COC Chorus produces, not to mention its members’ consummate acting abilities. It is understandable given his background that conductor Johannes Debus would relate Britten’s score so much to the music of Britten’s European contemporaries. Debus linked Britten’s use of the brass and his love of fugues and passacaglias strongly to Paul Hindemith while Britten’s soaring string passages, unusual rhythms and tart orchestral tonalities reminded one of Bartók. Debus’s approach had the effect of making the score sound absolutely fresh. The unanimity he achieves with the orchestra led to a reading of overwhelming force and impact. 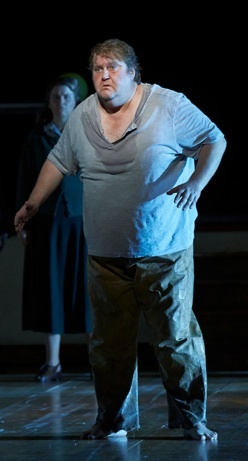 Musically and dramatically this is the most powerful Peter Grimes the COC has presented. Simply ignore the Dr. Crabbe figure and you will be caught up in a torrent of exquisite music-making and be free to ponder the complexities of right and wrong, man and nature, group and individual that the opera movingly explores. As of this writing, Ben Heppner is scheduled to sing the remaining performances. Note: A version of this review will appear in a few months in Opera News. Photo: (top) The Chorus in Act 3 of Peter Grimes; (middle) Anthony Dean Griffey as Peter Grimes. ©2013 Michael Cooper.